I first visited Eastern State Penitentiary about 10 years ago, and wrote about it in MidAtanticDayTrips in 2014, several years after the actual visit. It haunted me then, and still does. Even as the cell blocks high arched ceilings evoke a cathedral-like reverence, the cells still hold their secrets, and they're not giving them up. The cathedral imagery isn't an accident. The British architect of the penitentiary, John Haviland, chose the hub and spoke design based on prisons and asylums being built in England at the time. 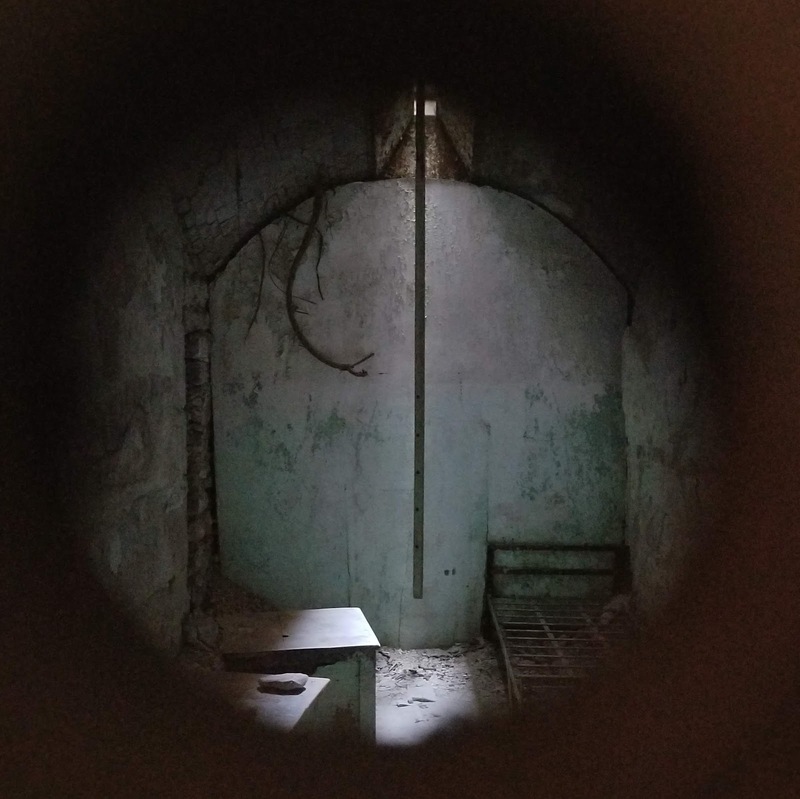 Eastern State originally featured an octagonal center connected by corridors to seven radiating single-story cell blocks, with a central corridor lined with single cells, which were meant to promote "watching, convenience, economy, and ventilation." Each cell was lit only by a single lighting source -- either skylights or windows -- which were supposed to represent the "Window of God" or "Eye of God," promulgating the view of imprisonment, usually in isolation, as an instrument to modify sinful (criminal) behavior. The isolation was complete. They were alone in their cells. Food was dispersed to them via a small square door in the cellblock. The only door they could actually go into and out of was the door leading to their exercise yard. If they had to go elsewhere, they were hooded. The time spent in in their cells was intended to help inmates reflect on their crimes, eventually leading them to contrition (redemption). Instead, many inmates went insane. A restored cell, with tools for shoemaking. Later on, as the facility became over crowded and the isolation and contemplation philosophy was abandoned, additional diagonal corridors were built, several with two levels of cell blocks. Inmates began to be housed two to a cell. Tree roots and vines still creep into the ruined cells. Haviland also gave the prison a neo-Gothic look to instill fear into those who thought of committing a crime. It's still imposing today. From the outside, it looks like an American's prototypical castle. From the inside, the 30-foot walls look impossibly tall. They block out everything but the sounds of the city outside. There have been some changes since that last visit. The hospital cell block has been cleaned up and is opened for guided tours. The cat art installation that was in place when we were there last has been removed and replaced with others. I don't remember the specifics of the audio tour, other that there was one, but I really don't remember hearing former inmates' memories of the place, which is part of the tour now. There're are now specialized guided tours offered by staff at the penitentiary, including tours through the cafeteria and kitchens and the former operating room and hospital cell block. Guided tours are offered during the winter, and during the warmer months, self-guided, self-paced recorded tours with headphones guide you through the cell blocks. The audio tour is narrated mainly by Steve Buscemi, with former guards, wardens and prisoners also contributing. The audio tour talks about the design of the cells, the evolution of incarceration within Eastern State, and about the inmates themselves. Notorious criminals such as Al Capone and bank robber Willie Sutton were held at the penitentiary, but it was the stories of the inmates talking about what it was like to be incarcerated at Eastern State that resonated. As you tour the facility, you may walk into several restored solitary confinement cells -- specially identified -- but most of them remain off limits and are filled with original rubble and debris from years of neglect. Some of the doors are still closed, but pinholes allow a glimpse of what's inside. Refining the revolutionary system of separate incarceration first pioneered at the Walnut Street Jail, Eastern State Penitentiary emphasized principles of reform rather than punishment and was operational from 1829 to 1971. Eastern State finally closed its doors in 1971, after 142 years in use. While Philadelphia debated what to do with the facility, it lay virtually abandoned to cats and weeds, which became trees as nature began to reclaim her own. The former penitentiary is now open to the public as a museum for tours 7 days a week, 12 months a year, and seeks to educate the public about the history of incarceration in America. Although it was significantly damaged during the two decades it lay abandoned, it now is being stabilized. Hours: For information how to reserve Eastern State for your own ghost hunt, please check the website.